While researching my family tree, I came across the Begley & Hinds family. Head: Frederick Hinds aged 52 noted as Proprietor Zoo and Amusement Park. Living at Salterhebble along with his wife Eliza. Stanley Hinds aged 22 and Harry Begley aged 16, down on the 1911 census as Animal Keepers. I can only assume they all ( including Uncle Frederick) worked at the Zoo at Exley in Halifax!! Not sure how true it is that Frederick was the proprietor of said zoo however? I spotted when reading the info here on the webpage (part 4), that Stanley Hinds is stated as being Head Keeper and was at Bostock Zoo previously. I havent come across that yet but do know that Uncle Frederick Hinds was in Glasgow working as an Animal Trainer / Lion Tamer. This is noted on the 1901 census and the address as 12 Burnside Street Glasgow. Milton. Lanarkshire. Scotland. I wonder if its a misprint / misunderstanding and it was in fact Frederick rather than Stanley who was the Head Keeper in Halifax Zoo and how noted so on the census of 1911? Frederick was in Glasgow at least 10 years, potentially training with James W Bostock as found him at various addresses in the city ( via directories) and his occupation noted as, Animal Trainer. I have the census of 1891 where James W Bostock and his travelling show are in Southport. 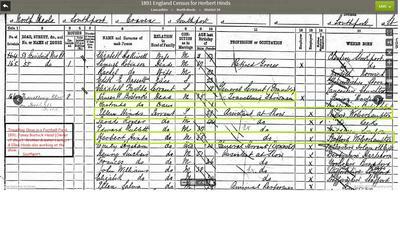 Though there appears no Frederick noted on the census, there is however Fredericks brother Herbert Hinds aged 35 and sister Ellen Hinds aged 29 working as assistants at the show. Frederick is in Glasgow, till they all appear in Halifax 1911. If i find any other information regarding Stanley in Glasgow, i will endeavour to pass it on. Are there any photographs of the Hinds / Begleys working at the zoo? How am i related to the family above, Albert Begley was my Mothers Uncle.